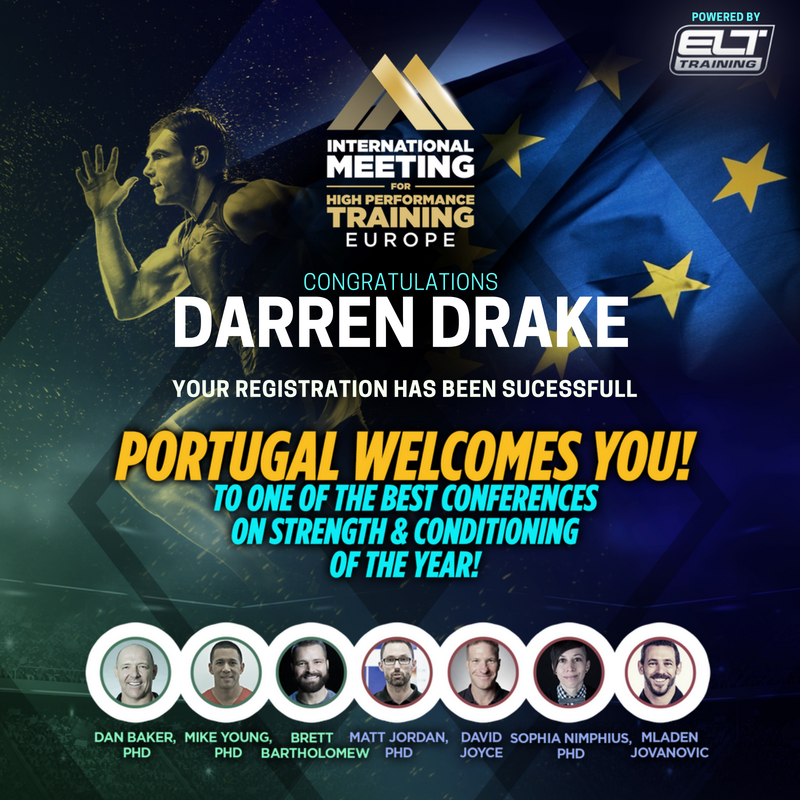 In this blog article I am going to talk about some of my reflections since returning from my week in Portugal, where I was attending the ‘‘International Meeting for High Performance in Training” October 15th-20th. This was a conference unlike no other I have been to. I wanted to go for several reasons. 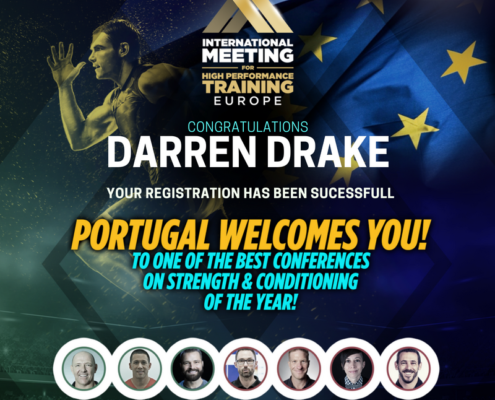 Yes, the line up of keynote speakers was fantastic but truthfully I had heard at least three speak in person already at UKSCA conferences, and everyone else speak either on a podcast or online. But it was because I knew all the speakers would be there all week because they were all taking it in turns to speak there throughout the week. This gave us a real opportunity to start conversations with them in a relaxed environment without the scrap to get your question answered at the end of the presentation before they would exit the building! And- yes because it was in Portugal and I hoped it would be a final opportunity to get some sunshine in this year in Europe. It was intense- 8am first presentation all the way through until 8pm Monday to Saturday- with a 1.5 hour lunch and 30 min coffee break, so 60 hours of presentations. At some point I will write a summary blog of my favourite presentations and a few take homes for each. But right now I just wanted to let some things simmer and reflect on how what I have heard has impacted my training philosophies and methods. I have taken a week to digest my experience and not surprisingly I have come right back to my basic beliefs and principles of strength & conditioning, my role in enhancing Sports Performance and the methods that I feel are most appropriate [for Tennis]. Several different themes have been going on in my head- but essentially it always came back to ”let’s get rid of the noise, and find out the things that we really need to focus on [in our sport or athlete population] so we can improve performance. What all the keynote speakers had in common was a clear appreciation for the demands of their sport that they were most associated with whether that be Rugby League- Dan Baker, MMA- Brett Bartholomew, Australian Football- David Joyce, Track & Field- Mike Young, Alpine Skiing- Matt Jordan, Team sports- Sophia Nimphius or Football- Mladen Jovanovic. c) designing the resultant physical training intervention that goes alongside that. I’m pretty happy with the performance tests for Tennis that I both like to do now, and I am considering doing in the future. 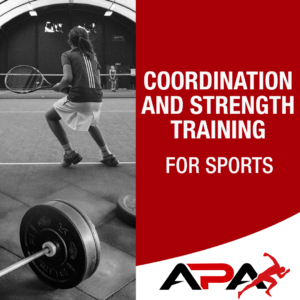 There was a lot of talk about the role of muscles in certain sports and how to prepare them specifically for their role in sprinting, jumping, or change of direction, but I’ll cover that in the summary blog. As far as the needs analysis goes I sometimes get frustrated that technology such as GPS is not widely used in Tennis. Physiologically we have a lot of information on Tennis and also a lot of kinematic information. But not much on the kinetics- the forces we experience from running and jumping. I could appreciate that when the GPS units were all we had, they can’t measure accelerations and jump elements that are so important to Tennis. But with advances in technology so that GPS units have in built Inertial Movement Units (IMUs) we can surely do better. But frustration aside, I wanted to take this blog down the path of actually understanding how we might go about getting to know our sport better from a Loading stand point – and building up a workload profile. This lead me to Load Monitoring. 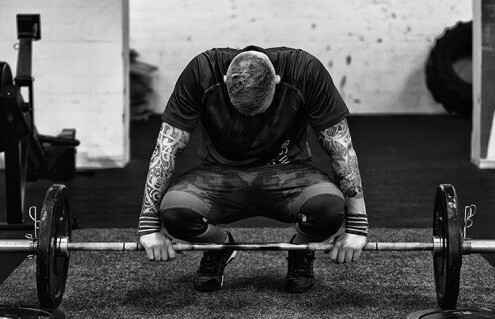 Ultimately if you know what the demands of the sport are- you can get fit to prepare your body to meet the demands of it- hence the title of the blog. As a Tennis coach or sports coach of any sport you have no doubt had a conversation at some point with a strength and conditioning coach or sports scientist who wants to tell you about how much work your athlete or team has done in the last match or last training week. How will we know if they have improved their fitness? How will we know if they have increased their fatigue? What is the typical workload profile of a match in competition? How much of our training week needs to be done at or above that workload to improve their fitness? How much of our training week needs to be done at or below that workload to reduce fatigue? Being able to answer these questions is essential to being able to design a safe and efficient training programme. Remember for some athletes, they will not be fit enough to meet the demands of the game. Others will find that playing matches will actually undertrain their fitness capacities and need more work. And at other times you will want to give them an easy day so they are fresh for a match. So it is important to consider everyone’s needs individually. 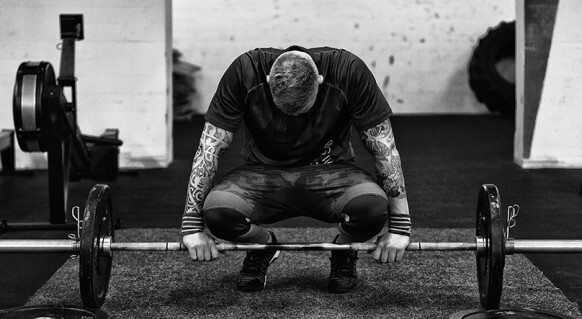 A well-designed training programme will expose athletes to a range of stresses, all of which will induce fatigue and adaptations to that stress to differing degrees. Without an objective measure of the stress being imposed on the athlete, or their response to that stress, coaches and sports scientists are unable to quantify the true effectiveness of their interventions. The consequences of failing to correctly measure those loads can be under- or overloading of athletes, either of which can lead to injury or illness, contributing to sub-optimal performance levels. So how can practitioners measure the load being placed on their athletes? More importantly, how can they use information to derive meaningful insights to help address performance questions and support the work of coaching staff? Fitness can be seen when a player is capable of doing more work in a given time period. Fatigue might be shown when they do less work in a given time period, or if they are unable to repeat the work in a defined period. To help us build up a picture of the typical amount of work (Training Load) we experience on a Tennis court and how we respond to that stress we need to talk about External and Internal load. Over time, you will be able to build up a workload profile of what a player typically does in a training and match scenario. At a basic level, external load can be characterised as the sum of the work completed by an athlete during a particular training drill, session or period. In terms of wearable technologies, measures of external load can be categorised as locomotive (e.g. distance covered, average velocity, number of sprints etc.) and mechanical (e.g. Player Load). The GPS data calculate running velocities, which are traditionally expressed as distance covered, time spent, or frequency in different velocity categories. For intermittent sports such as tennis, this approach is potentially inadequate because maximally performed changes in running velocities and directions over short distances are misinterpreted as low to moderate intensities because the attained velocities are not high. Furthermore, GPS won’t give information on things like jumps, tackles and kicks important in a range of sports. GPS and IMU data in Tennis. I have paraphrased part of his article below to include the categories he mentioned, and added my comments. Even if we cannot accurately assess running velocities and accelerations we can at least measure Heart rate to give us an idea of physiological load- more on this later. Rhythm and patterns– drilling. Can be used for on court cardio. Consider if 80% of ralleys are less than 4 shots, do elite players really need so much time to develop rhythm and timing and confidence? Serve & Return– typically practised later in a session when fatigue has set in. Given its importance should it be done early in practice? Points based play– playing sets, or drills that simulate match based scenarios. Typically done later in the week. Should it always be done in the afternoon and later in the week? Speed work– single ball feeds at flat out speed and lots of recovery. How much of this work is really done? Let’s say, for example, that a singles match exposes the player to a 450 PlayerLoad amount of work. In addition, each match requires around 60 acceleration efforts (from 2-4 m/s) with a total distance covered of 3000 metres in the whole match. You might set a Technique, Serve & return and Speed work session as 300 PlayerLoad. A Points based session might be 450 PlayerLoad (same as a match) and a Rhythm and patterns session (used for volume and conditioning) as 650 PlayerLoad for example. Okay- so let’s say we have started to plan our training schedules optimally so there is enough work to prepare our players for the actual workload demands of the match, and get them fitter without getting them too tired. What’s next? Well, we need to determine if the planned workload actually had the desired level of stress on the body. The outcome of any training intervention is therefore the consequence of both external and internal stimuli and reliable monitoring tools are vital for the optimization of athletic performance. External load may be more easily observable for practitioners, but it is internal load (the cardiovascular and metabolic stresses placed on an athlete during a bout of work) which determines the overall outcome and an athlete’s subsequent adaptation to that stress. Ultimately, the majority of coaches will look at the relationship between internal and external load metrics to measure athlete efficiency. I have suggested two levels of Internal load monitoring according to the resources you have available at your club. The monitoring of intensity of sessions at Level 1 is conducted using a metric called Session RPE. RPE stands for Rating of Perceived Exertion, and requires a subjective assessment from the athlete of how hard each drill or session was based on a scale 1-10. At Level 2, a method of quantifying internal training volume is introduced. Heart Rate Exertion (sometimes known as Training Impulse) breaks down athlete heart rate into a series of bands proportionally related to an individual’s maximum heart rate. So whether you use a Level 1 tool or a Level 2 tool you can now quantify the physiological stress (internal load) imposed on the body by the training session/match (external load). I personally would ideally like a combination of the two. Having a heart rate monitor will be very useful for the Rhythm and patterns session. But if you’re doing a technical and/or speed session the Heart rate may not be very high but the sRPE might be higher accounting for the higher mechanical and/or psychological stress. At the end of the day, if you are the sport scientist you are giving information to the coach to let them know if the session was effective in achieving its goal, whether that be to increase fitness or reduce/minimise fatigue. The final piece of the puzzle is monitoring the day to day fatigue. In some cases you are trying to increase fatigue so you can improve fitness. This may involve doing a session that is ‘‘tougher than a match.’’ So you expect them to be fatigued. But how many fitness based sessions can a player handle in a week and how do you plan them in the lead up to a match? My example is actually going to draw from team sports first. This is because in these sports the match itself is usually the most stressful activity of the week in terms of workload. Everything is about building up to that important Game day at the weekend. We will discuss Tennis after that. So let’s assume match demands and intensities are known, and we have set a weekly practice plan for use during the season. We have also tested through trial and error what we expect the Internal Load to be. Using a Football example, let’s say that a typical PlayerLoad on a Saturday match is 600 AU. If these are their normal demands on match day, it would stand to reason that achieving similar numbers a day or two before the game would not be ideal. The only gains that occur a day, or week, before competition is fatigue. Athletes cannot expand their gas tank in such a short time frame, they can only burn the gas already there. The best teams are at their optimal capabilities on match day. Therefore, tapering practices as the match draws closer is vital. The other side of the coin is that if athletes are not exposed to some of the match-like speed and volume demands in practice, then they are more likely to perform poorly, and be more prone to injury, during the match. In general, having one practice that approached match like demands early in the week (3-4 days before competition) with each subsequent practice decreasing about 25% from the previous one is a good starting point. It’s a bye week so no harm, no foul, right? Wrong. Scientifically speaking, the acute: chronic ratio for this athlete would have gone from 1.0 (i.e. 1:1) to 1.51. This 51% increase in activity would result in an increased chance of injury during the week and the next week. So what you do in one week can have a consequence in the next week. When you resume your 2250 PlayerLoad week they will be more tired so you need to account for this. Usually athletes need to plan for a lighter week every 5-6 weeks with a few days off. Ideally they will have a complete week off at least every 12 weeks. Tennis is a bit different. If you are a younger player then it will look quite similar to football as you might train during the week and play a match (or two) at the weekend. But for a junior international player or a Professional player you are often competing for several days each week, and sometimes more than one match a day. If you are at the bottom of the draw success might be winning the 1st round so you need to be in peak condition for the first match at the start of the week. If you lose early, then you can resume training for the rest of the week. That means your training in the previous week might be a bit lighter in the few days leading up to the first match. If you are one of the favourites then you might need to plan for being there until the end and need to try to recover so you can play 4-5 matches over 4-5 days and still be as fresh as you can at the end. This means there will be no physical training as such until the tournament has finished. Unlike Team sports, I personally find that going out competing for several days can in some ways be a bit of a vacation away from training at base-from a physical stand point. Let me explain. A typical match contains only 20-30% of the time hitting balls. In training it is often the case that players will be doing sessions where they are hitting balls for much more than 20-30% of the time. Having said that players will often rate their matches as hard, so if they played a match that lasted 2-3 hours it can be comparable to a training session. But again, if you are smart, you can look at the PlayerLoad for each day in competition and compare it to their normal training and competition PlayerLoad and start to get an idea of how stressful that match is on their body. The Internal load data you have will support this observation. This is when day to day fatigue management is key. When you’re playing matches every day it’s still a good idea to monitor fatigue levels the next morning (How to do this-we will save that for another post). This way you can determine how well recovered they are from the previous day’s match. If they experienced a big external load and reported a big internal load but their fatigue markers are not significantly down- you know they have recovered well. If they haven’t, it’s not like you cannot play the match but it is helpful to know in case you were planning to do more than the usual 30mins practice before the match or possibly do some extra fitness because you thought the previous match was quite easy. When you’re back at base training you also want to monitor day to day fatigue. If you find they haven’t recovered well after the previous day’s practice you may make some modifications to the day’s workout- especially if you’ve planned another hard day. As we discussed earlier there needs to be variation in the day-to-day workload exposures placed on the athletes so that they do experience match-like demands, but with the opportunity to recover so as to limit the injury potential of several high demand days in a row. Again, the lower workload days should be as crisp and fast as the higher load days; the only decrease is in volume. For tennis we might refer to the categories of workload we spoke about earlier to determine the best implementation of the Plan depending on the goal of the week, and the athlete’s response to the workloads. In an environment where there is sophisticated monitoring technology, a good starting point is to relate metrics back to the work an athlete usually does in a match, then report training data relative to match equivalents. For example, a training session reported as 60:80 for volume: intensity would mean that the athlete has performed 60% of the work they would do in a match, with the average training intensity being 80% of a match. In terms of distilling internal and external load data down into actionable insights, this is as good a starting point as any.